Goodyear Size: 30.0x9.0-15 Rim: 8-10" Tread: 9.0" Section: 12.4" Ave. Roll Out: 96.9"
Smart drag racers know it takes more than skill to win races... it takes tough drag racing tires. 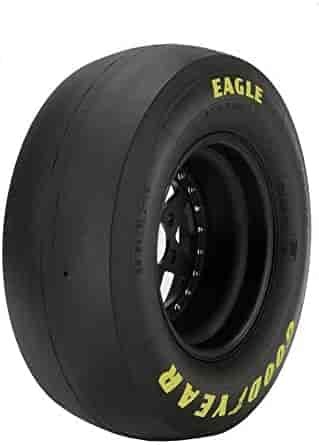 That's why, year after year, Goodyear is the first name on the finish line so fly with the Eagles! D-2 For Pro Mod. Slightly more starting line hook than D-2A. D-2A For Pro Mod, TA/D, TA/FC, Pro Stock and other high-horsepower applications. D-2E For TF/FC and other high-horsepower applications. D-2F For TA/D, TA/FC and other high-horsepower applications. D-1A For Stock Eliminator. Offers superior longevity while maintaining or improving grip levels of D4B. D-1 For use on dragsters and other lightweight cars. D-9 For use on motorcycles. D-4B For Stock Eliminator. Slightly more traction than D-4A. D-4A Good for hot and/or slick track conditions. D-6 Works well on dragsters and 1500-2500lb cars. D-5 Works well on 2000-3200lb cars. D-7 Limited application compound. Can help eliminate shake.